“The credibility of the Christian message would be much greater if Christians could overcome their divisions and the Church could realize ‘the fullness of catholicity proper to her in those of her children who, though joined to her by baptism, are yet separated from full communion with her.’ We must never forget that we are pilgrims journeying alongside one another. This means that we must have sincere trust in our fellow pilgrims, putting aside all suspicion or mistrust, and turn our gaze to what we are all seeking: the radiant peace of God’s face.” – Pope Francis, Apostolic Exhortation, Evangelii Gaudium. Last October Pope Francis met with the leaders of the Worldwide Lutheran Church in Lund, Sweden to pray for healing and reconciliation before the upcoming 500th anniversary of the Protestant Reformation. Following the Holy Father’s example Fr. 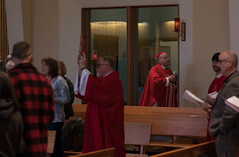 Pat Travers, Diocesan Administrator for the Diocese of Juneau, participated in an Ecumenical Prayer Service, “From Conflict to Communion,” along with Lutheran Bishop Shelley Wickstrom. 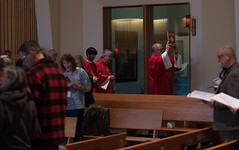 The Ecumenical service took place at St. Paul the Apostle Church in Juneau. During the service representatives of the Catholic and Lutheran communities read excerpts on thanksgiving and repentance from the report created by the Lutheran World Federation & the Pontifical Council for Promotion of Christian Unity, entitled “From Conflict to Communion.” Following a sign of peace between the congregations, John 15:1-5 was read, and a sermon was shared by both Fr. Pat Travers and Lutheran Bishop Shelley Wickstrom. The service concluded with the reading of five commitments between Catholics and Lutherans found in “From Conflict to Communion” and the lighting of five candles.